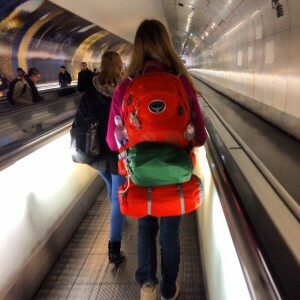 World Rovers » Are You Teenagers? Of course, my grey hair proves I’m not, but it is the type of thing that you usually do much earlier in life. For us, hiking the Camino de Santiago is an adventure, an opportunity to do research for the sequel to my novel, The Last Apostle, but most of all, it’s a demarcation between our corporate lives and what we call Life 2.0. We’ll seek to discern God’s plan for our lives on a pilgrimage that dates back twelve centuries, following in the footsteps of tens of millions of people. Last year approximately a quarter of a million people made this journey. We’ve worked hard to prepare for this experience. But I’m sure that there are many surprises just over the next hill. TRAVEL UPDATE: Many modern day pilgrims fly into Madrid to start their pilgrimage. We found it much cheaper to fly into Paris from Seattle. It also gave us a chance to acclimate, explore the city a bit (including a noon mass at Notre Dame), and try to recover from colds. 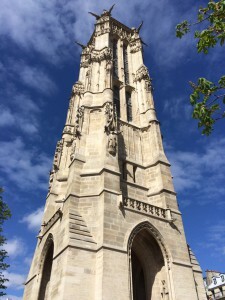 We also visited the Tower of Saint James (Le Tour Saint-Jacques) in Paris, which was a traditional starting point for pilgrims in earlier years. The tower is all that remains of the church of Saint James, post French Revolution. Royalty wasn’t the only institution to suffer at the hand of 18th century revolutionaries. They lopped off more than heads. As I write this we are in a train racing across the French countryside to St Jean Pied de Port, our starting point in the French Pyrenees. We will cover about 500 miles (800 kilometers) in six hours today. The next 500 miles from St Jean to Camino de Santiago will take about 40 days.